"The Coalition is raising concerns about the potential cover up of an attempted murder and the refusal, to date, of the prison to identify the missing 37 or more inmates deemed “conspirators” by the Department Of Corrections." Friday, Dec 31, 2010 The Concerned Coalition to Respect Prisoners’ Rights learned that on or about December 16, Terrance Bryant Dean was severely beaten by guards at Macon State Prison where he was incarcerated. The Coalition asserts this brutal beating was not isolated and was a retaliatory act carried out by the Department of Corrections (DOC) against non-violent striking inmates. The Coalition was formed to support the interests and agenda of thousands of Georgia prisoners who staged a peaceful protest and work strike initiated in early December. The Coalition is concerned about continued violent retaliation against the multiracial group of prisoners who staged a peaceful protest to be paid for their labor, for educational opportunities, access to family members, an end to cruel and unusual punishments, and other human rights. The eight-day strike, begun in early December, involved united prison populations at various prisons, including Hays, Smith, Telfair and Macon State Prisons. Dean’s mother, Mrs. Willie Maude Dean, stated that since she learned from inmates that her son had been beaten, she has been given no information about his condition or whereabouts by the DOC, and that she and Dean’s sisters, Wendy Johnson and Natasha Montgomery, have been denied access to him since they discovered he was hospitalized at Atlanta Medical Center. It was around the same time of this beating that the Coalition was meeting with the DOC making the demand that a Coalition fact-finding delegation be provided access to certain prisons to investigate conditions inside. Mrs. Dean told Coalition leaders last night that when she asked Macon State Warden McLaughlin where was her son, based on concerns raised by prisoner reports he had been beaten nearly to death, McLaughlin told her he was “in the hole,” or, an isolation cell. In fact, Mr. Dean was already in the hospital. The Coalition is raising concerns about the potential cover up of an attempted murder and the refusal, to date, of the prison to identify the missing 37 or more inmates deemed “conspirators” by the DOC. The Coalition is calling for the DOC and other state officials to sit down with the inmates to start a process to realize the inmates’ human rights. The Coalition, which has grown into an entity of thousands of supporters and hundreds of organizations across the U.S. and internationally, includes the NAACP, the Nation of Islam, the ACLU, the U.S. Human Rights Network, All of Us or None, The Ordinary People Society and many others, and is co-chaired by Dubose and author-activist Elaine Brown. A Coalition fact-finding delegation visited Macon State Prison on December 20 and was visiting Smith State Prison yesterday, December 29th, when the Coalition uncovered facts about Mr. Dean’s reported, brutal beating. The Coalition is planning to release a full report of its investigations and prison visits once the investigations are completed. Family members and Coalition members, including NAACP Georgia State Conference President Ed Dubose and Georgia ACLU Legal Director Chara Jackson, will attempt to see the beaten prisoner today at Atlanta Medical Center. 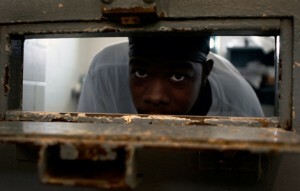 Photo Above: Young prisoner Rodriques Dukes in solitary confinement at Georgia's Hays State Prison. Below are links to the limited coverage of the strike since it ended officially on December 18th. It ended on the condition that a fact finding coalition would be permitted access to several of the Georgia prisons to investigate conditions inside as well as begin the process of negotiationon the demands. The coalition has since discovered that on or around Dec 16th Terrance Bryant Dean was severely beaten by guards, nearly to death according to prisoners' accounts, and his whereabouts concealed from his mother who had contacted the warden. 37 or more men, whom the Georgia DOC had deemed conspirators of the strike, remain missing - their status and whereabouts unknown. "The Coalition is raising concerns about the potential cover up of an attempted murder and the refusal, to date, of the prison to identify the missing 37 or more inmates deemed “conspirators” by the DOC." Below are older links about actions in support in the Bay area and Richmond VA.